Time for another Random Photo Shoot! Today we have a gallery of 3.75 Inch scale DC figures based on the Injustice video game. These figures are done by DC Collectibles, branching out from their Green Lantern 3.75 Inch subline. This pack features Wonder Woman in her Amazonian gear and Solomon Grundy, oversized to match scale in the game. Out of the 2, Grundy takes the cake as a solid figure with decent articulation, awesome paint apps and superb sculpting. Wonder Woman feels a bit frail, and didn’t come with a sword (the one seen in these pics was added by us). However overall, these are great additions to a DC shelf and for those itching for non-kiddie 3.75 scale DC stuff. Check out over 35 high res images of the figures after the break! 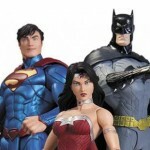 Disclaimer – these figures were provided by DC Collectibles for review purposes.